The Euphorbia genus contains a wide and diverse range of ornamental plants, from the smallest of annuals to full grown trees. One of the best-known, though least exciting species is the Poinsettia plant which is always around at Christmas time. 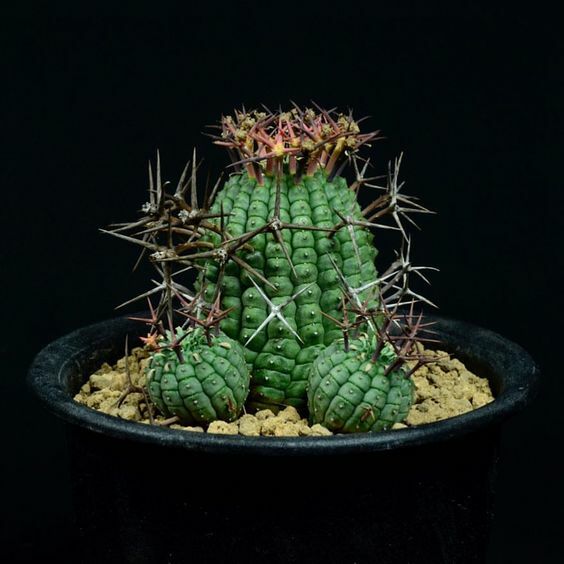 Further Euphorbia species, especially those native to Southern Africa and Madagascar, have taken on several physical characteristics of common Cacti from Northern and South America, which at times creates difficulty distinguishing exactly to which genus they belong. Their stem structures have evolved to withstand the harshest environments, many species becoming both drought and heat tolerant, changing their stem structure to store as much water as possible whilst reducing natural water loses through their lack of leaves. Euphorbias have always been a firm favourite with collectors and succulent growers, being such a broad and unusual genus comprised of over 2000 species of uniquely individual flowering plants. Some species are more highly valued than others, but all are sought after for their aesthetically intriguing form and minimal flower structure. These beauties are one of the most popular of all genera in succulent collections. With plants natively sourced from tropical and subtropical regions of Africa, The Americas and many temperate regions worldwide, the Euphorbia family excites the green fingered amongst us, from enthusiastic beginners to the most advanced collectors. You will find enough variety within this vast plant group to sustain your cultivation interests for many years to come. The Euphorbia genus has a whole collection of spectacular species each with a very different appearance and each uniquely beautiful. A number of the most sought-after species have a large swollen stem, called the Caudex. Naturally this caudex stores water and grows underground. 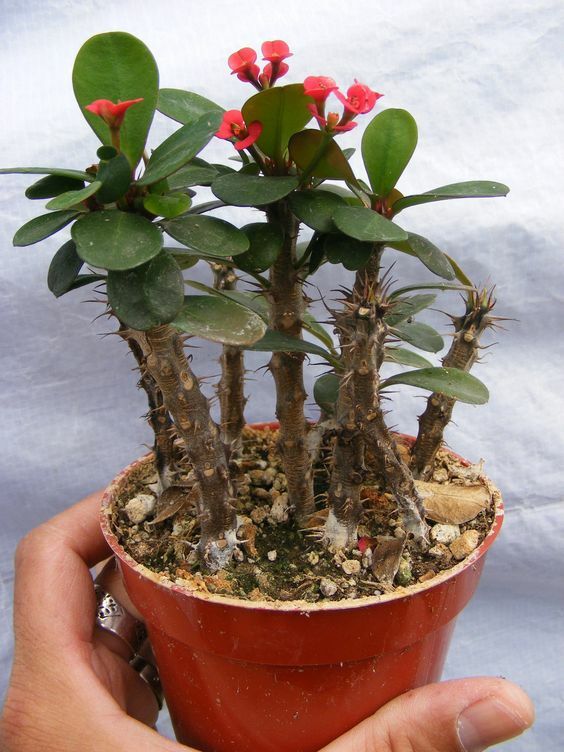 Examples of Euphorbias with this modification include Euphorbia stellate, Euphorbia francoisii. When in home-grown cultivation, we prefer to plant these strangely wonderful specimens with their caudex above the soil line, this way we avoid any problems with overwatering and caudex rot. 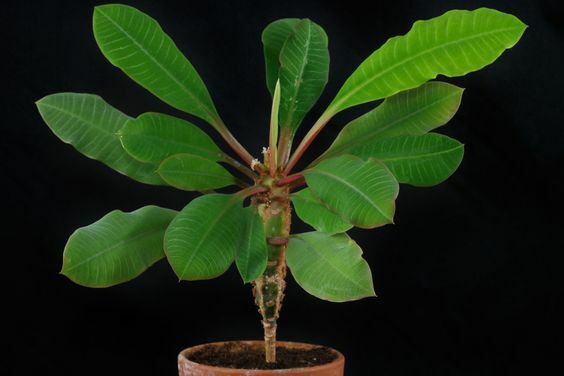 A common feature of almost all plants in the Euphorbia genus is their toxic latex stem sap. This sap has a milky appearance and is a common cause of skin irritation when touched. It has further toxic properties when ingested, so be sure to keep small hands and pets away from your plants. Always remember to wear gloves when handling your plants and avoid touching sensitive areas of the face. 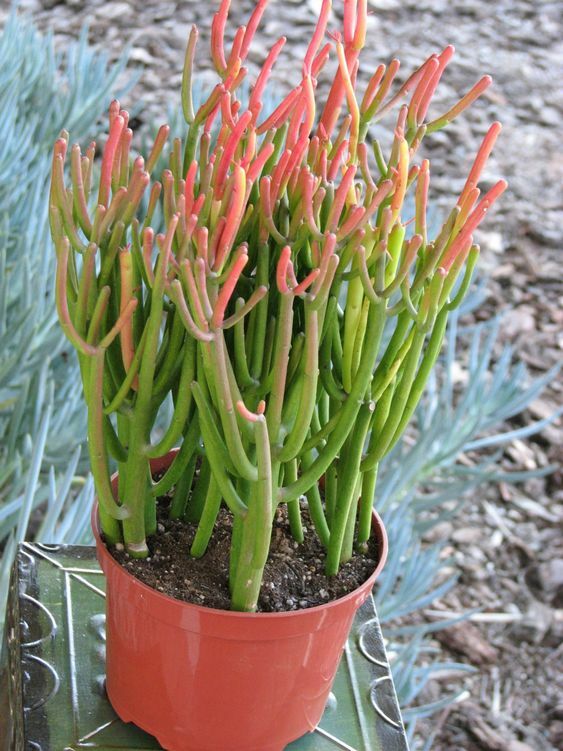 You will also find many Euphorbias with beautifully marked, intricate stems patterns. Some species of Euphorbia are dioecious, meaning that an individual plant will only produce male or female flowers. Commonly, a single flower is comprised of many smaller flowerheads, each of these is reduced to the bare minimum, comprising of only the essential components needed for sexual reproduction to take place. The male flowers have been reduced to only the stamen, and the female flowers to the pistil. Other Euphorbia species, however, will produce flowers of both sexes, sometimes spaced throughout the year and not always at the same time. 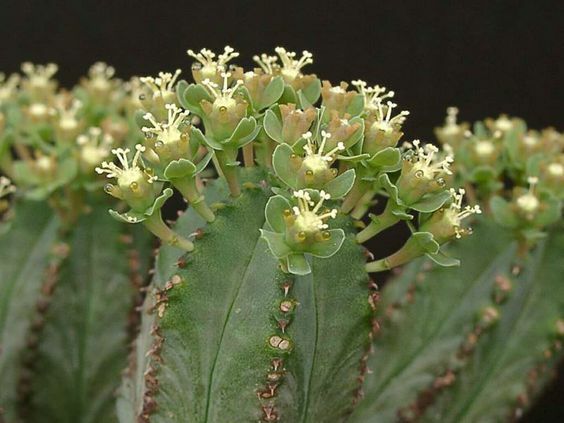 Unlike other flowering plants, Euphorbias have no sepals or petals to attract pollinators. Parts of the flowerheads and its supporting structures have evolved over time, changing in both colour and shape. These changes include prominent, bold coloured flower bracts which attract essential pollinators, doing the job of petals and sepals in “normal” flowering plants. All Euphorbia species have a cyathium, or “Cyathia” in plural, this is a totally original structure which no other plants have. The main part of the cyathium is the cup, or “involucre”. This is a cup-shaped structure on whose edges grow the nectar glands (which attract pollinators). Inside the cup grow the flowers. Plants which produce both male and female flowers, only produce these on separate cyathia. The genus is said to be named after Euphorbus, the Greek physician of King Juba II from Namidia. (Incidentally, Euphorbus went on to marry the daughter of Anthony and Cleopatra). Keen in his work, Euphorbus spent time finding medicinal uses for certain plants within this vast genus, one being recorded as Euphorbia obtusifolia which was back in his day used as a powerful laxative. The great Swedish botanist Carl Linnaeus assigned the name “Euphorbia” to the entire genus in the physicians honour back in 1753. It was entered in his famed works on binomial nomenclature and taxonomy, named “Species Plantarium”. Now we’ve dealt with the scientific bit, let’s take a look at some fine examples of little and large Euphorbia species along with their recognised common name. 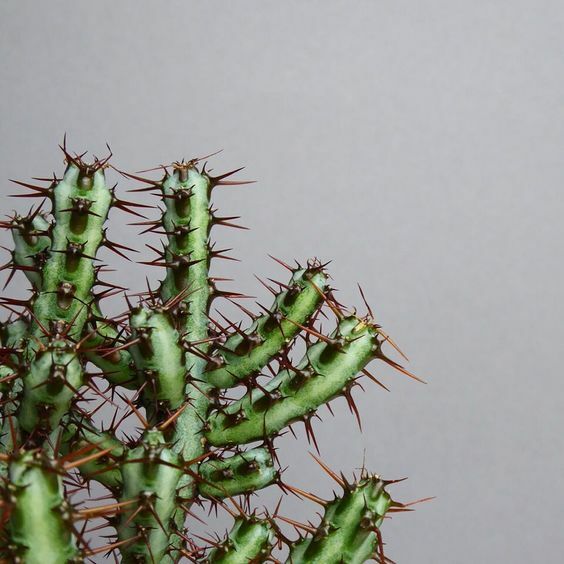 I’m sure you will all be familiar with this popular prickly house-grown plant, native to Madagascar and likened by some, to the crown of thorns worn by Christ. In maturity the Euphorbia millii reaches around 1.8 metres, that’s 6 feet tall, with several woody-looking slender stems. Each stem is heavily spined, each spine growing up to 3 cm, 1.2 inches long, which natively helps the plant scramble towards the light. There are few leaves, these are generally only produced on the new tender growth and are fresh green in colour. The flowers are very small, though mass-produced and each surrounded by showy red bracts from early spring time to mid-summer. Flowers of this superb and relatively small specimen, will be in constant supply when given enough heat and water. There are several varieties available – red being the most common, but pinks and yellow varieties are catching on and growing in popularity. The giant of the genus, growing into a huge, multi-branched leafless tree and reaching up to 10 metres, 33 ft, in height. In its natural landscape of Africa, it is seen a strong architectural plant, taking over much of the arid landscape. Tall and cylindrical with prominent spines which both in nature and cultivation, can grow at an alarming rate if it has free root run. The Euphorbia ingens is one of the most spectacular species, if only for its sheer volume. Very similar to cacti in looks and form, most often used for ornamental plantings and in offices, shopping malls and large buildings. Not one for the feint-hearted collector, some smaller slow-growing species are better suited to a greenhouse environment. 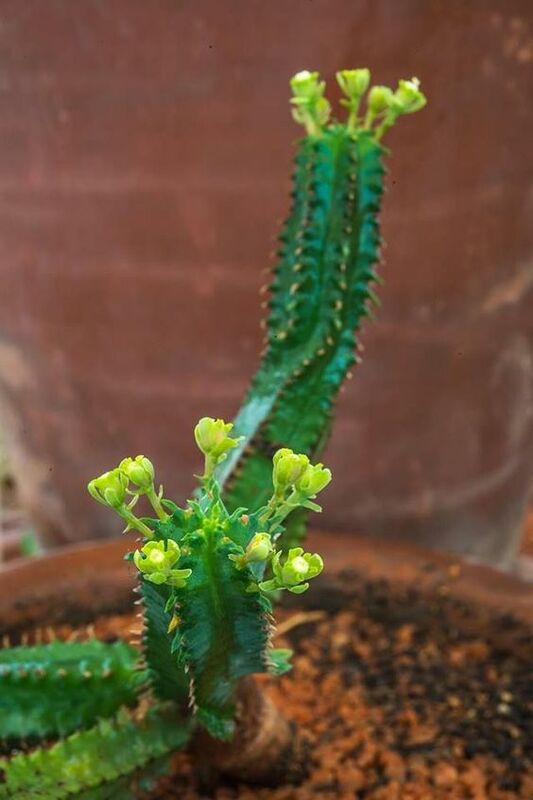 As the name suggests, the Euphorbia trigona is another species with native central African roots. Upright in stature, and forming upright branches, this specimen has a rugged look with glossy green patterned stems and branches, each having two or three sides. Small, very sharp thorns are produced in pairs, alternating the stems vertical ridges with small teardrop shaped leaves. 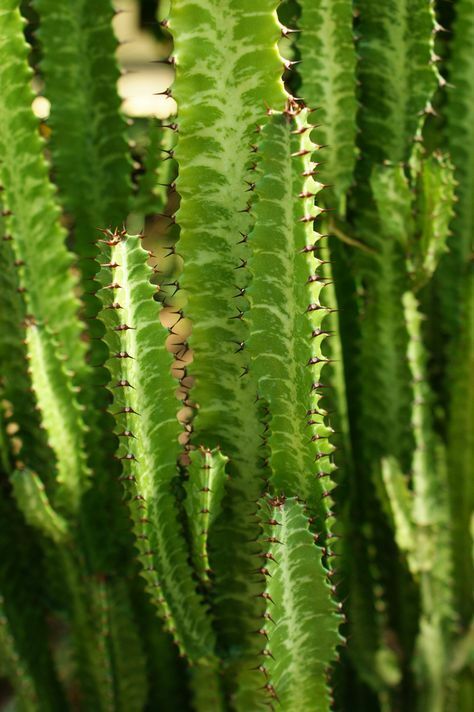 The Euphorbia trigona is a popular house-grown plant with significant structural interest and wonderful outer markings, much like a snake-skin with a light green centre. Expect a mature height of up to around 3 metres, but ensure appropriate support is provided. This species has a shallow root system and can get rather top-heavy. 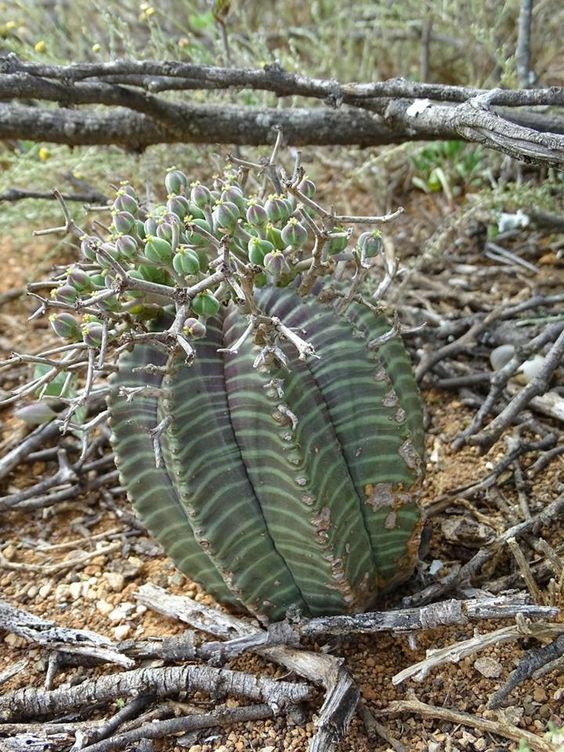 The Euphorbia gorgonis has a small and squat growing form, native to pebbled terrains in the Eastern Cape Province of Southern Africa where it is often found growing flat to the ground. 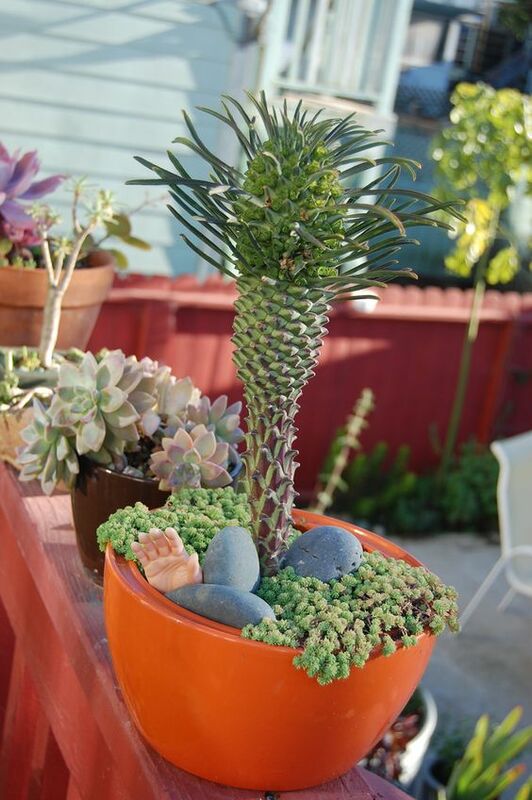 A spineless species of the “medusa head” Euphorbia with a broad main stem caudex. This caudex bears a compact crown of radiating branches around a slightly concave centre. A choice species for collectors drawn to its symmetrical form and neat habit with a prize stem caudex. An easy, slow growing ornamental specimen with a potential long-life expectancy. Very popular for enthusiasts and beginners alike. Native to Southern Africa and another small growing shrubby specimen, the Euphorbia aeruginosa has a clump-forming habit, producing upright, branching, 4-sided pencil-like stems, in rich aqua blue. Strong red and copper spines are positioned in pairs along the vertical edges on each sides of the stems. This is a really unusual and attractive specimen, perfect for home-growing and reaching a mature height of around 7 inches, 17 cm, with a spread of 10 inches, that’s 25.4 cm. Tiny yellow flowers are produced on the slender stems around February time. Another wonderful small and South African species, from the eastern Cape province through Transkei and Natal. 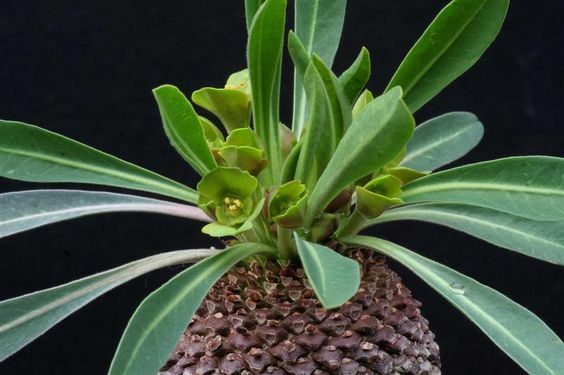 The Euphorbia bupleurifolia is a unique and fascinating succulent with a swollen caudex stem, woody and rugged looking, much like that of a pineapple, hence its common name of Pine Cone Plant. From this woody, swollen stem grows a tuft of slender, mid green ovate leaves, each with a central white leaf margin. 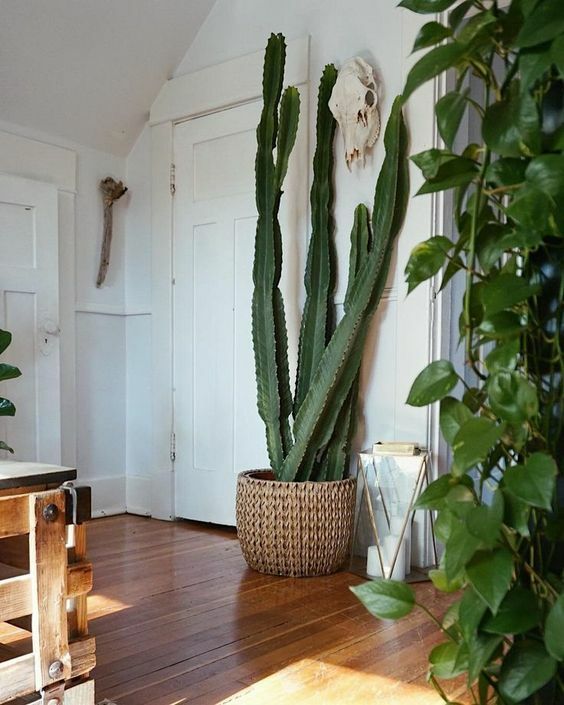 A perfect house-plant species, growing to around 16 inches tall, around 40 cm, sometimes growing as a solitary caudex and other times branching from the base. With an interesting common Afrikaner name meaning “neck of an ostrich”, referring to the upright, knobbly and tall cylindrical stem structure. The Euphorbia clandestina is native to the Southern Cape regions of South Africa and often found growing on rocky hillsides alongside other low-growing shrubs which help to support these upright succulents. These are a spineless species, sometimes branching or with a sole upright stem, always bearing a long tuft of slender and finely haired, turquoise-blue leaves. Their unique flower structures are hidden by the mass of leaves, though tiny yellow-green flowers in time appear from beneath. A stunning plant reaching a mature height of 2 feet, 61 cm and a spread of 12 inches, that’s just over 30 cm. Another great specimen for home-growing and a definite master of nature. A medium sized evergreen specimen, endemic to Madagascar and commonly found growing in the many rocky forest regions. This small, branching tree reaches a top height of up to 6 feet tall, 1.8 metres, and bears some of most attractive foliage of all Euphorbias. The upright and woody stem matures into a four-sided, swollen stem structure, deep green in colour and with prominent vertical margins. Leaves only grow on this swollen part of the stem and when produced they are long, oval and dark green in colour. When young, these leaves have the most exquisite white vein markings, contrasting beautifully against the dark foliage. 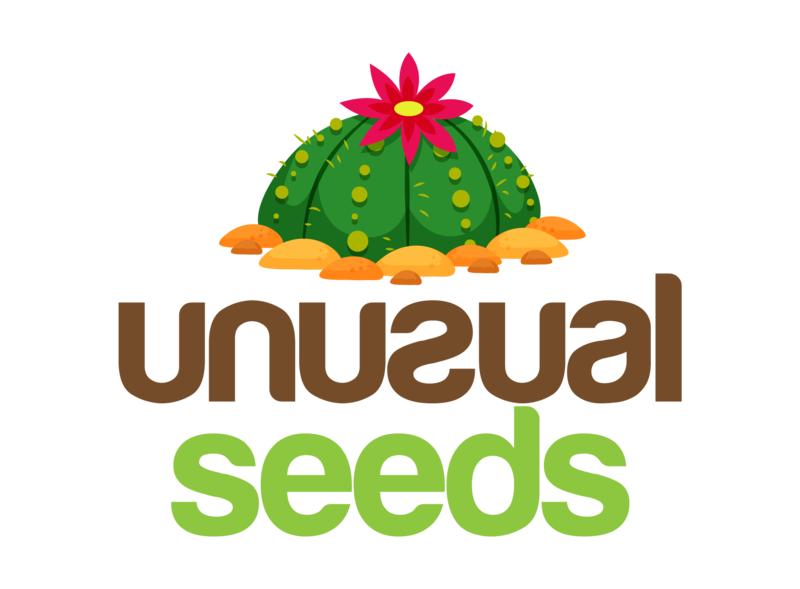 The flowers and seeds are produced from the swollen central stem structure, where when ripe, the seedpods will literally burst open and away from the plant, a handy mechanism for spreading the seeds. The Euphorbia leuconeura is a stunning house-plant – one of those weird and wonderful combinations, sure to attract attention and pretty easy to grow too. 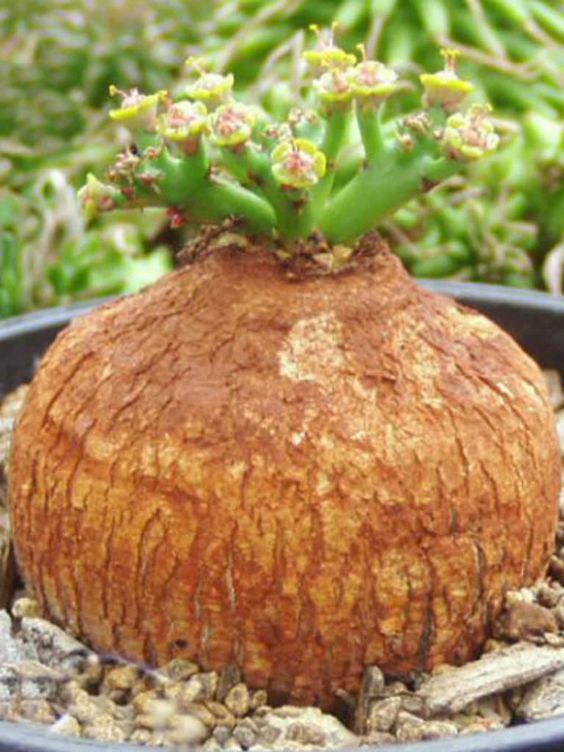 The globular growth structure of this native South African dwarf succulent, has earned the common name of Melon Spurge. Its rounded form has eight vertical stem margins, each of these prominent with often striking vertical patterns in-between. 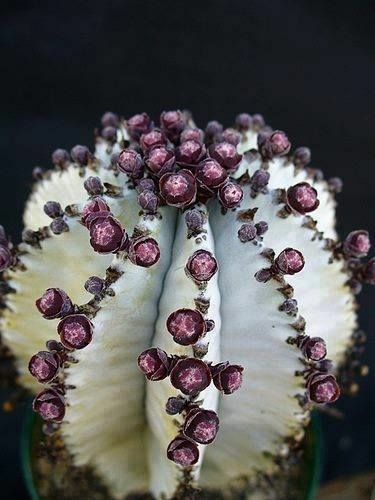 Instead of spines, this specimen has small, evenly spaced knobbles on each margin which run from the top to the base of the succulent. In time, branching, bright green, slender stems are produced on the top of the plant, bearing very tiny, mustard-yellow flowers. I really love this species, especially their wonderful form and staggering stem markings. There are variants on the stem colours, ranging from aqua blue to a richer deep green. Each globe can reach a diameter of around 12 cm, that’s 4.7 inches, making is small and perfectly formed for home-growing on that sunny and vacant windowsill. 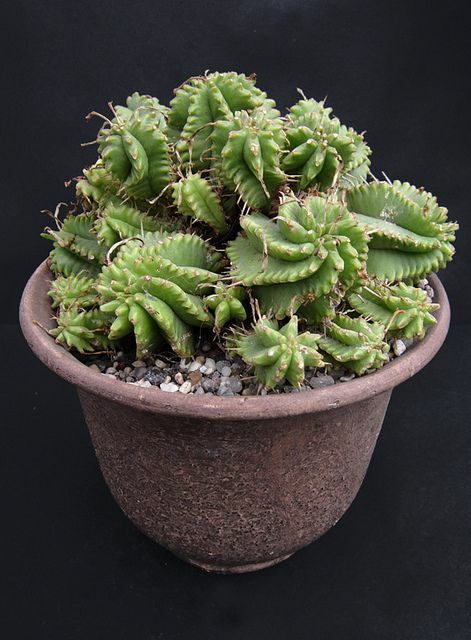 Native to the Cape Province of Southern Africa, the Euphorbia mammallaris is a short-stemmed succulent, maturing into a fiercely spined and densely clustered specimen plant. Its stems are thick, erect and ribbed, looking much like their common nick name – corn on the Cobs, though bright green in colour. Each stem has vertical rows of tubercles, which produce long pink and brown spines. Further branches of a similar shape, grow horizontally and arch upwards near the plant base. Its few leaves are small, bright green and short-lived, though its flowers come in the form of a solitary yellow cyathia, produced at each stem tip in late winter to early summertime. 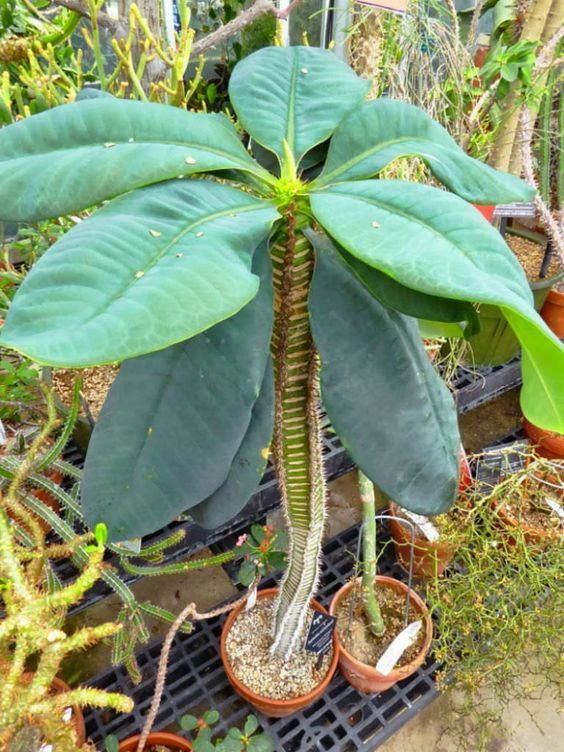 A very fierce and funky looking specimen plant which reaches a mature height of up to 13.75 inches, 35 cm tall. The variegated version, or “variegata”, has wonderfully cream and emerald green stems which turn to a purple-pink in the sun – a real stunner. Now comes a very popular succulent house plant, native to the Cape Province of Southern Africa and another personal favourite of mine. 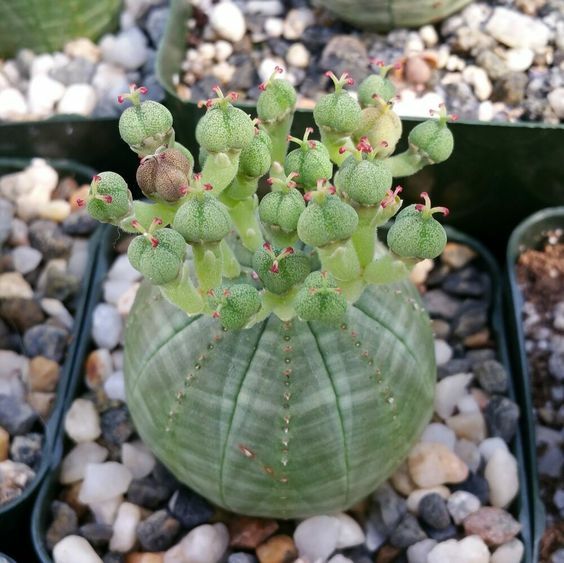 The Euphorbia obesa has an almost spherical form, ranging from bluey-grey to green, with 8 – 10 vertically “stitched” rib margins. What draws enthusiasts to this small, though sublime succulent is its dark and intricate markings, running horizontally from ridge to ridge on the spherical stem structure. 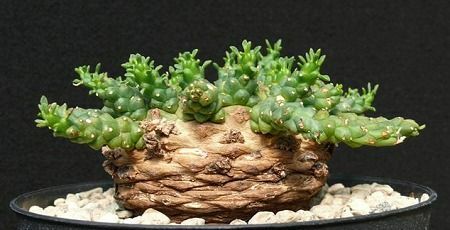 Reaching a height of just 7.87 inches, 20 cm, and a diameter of only 3.5inches, 9 cm, the Euphorbia obesa is a mini plant with loads of character and interest. In the sunlight, the stems take on a purple-red hue which only adds to their “wonder”. These are always singular stemmed, slow-growing and unbranched specimens, with each seedpod only containing 2 to 3 seeds. There are leaves, all be it tiny ones and very small scented green-yellow blooms borne on the stems rib margins. Over-collection has natively caused these to be an endangered species, though they are very popular and now widely cultivated in many botanical gardens. Here we have an erect succulent, endemic to Madagascar and growing to around 3 feet tall, 90 cm. Their stem structure is four-sided and club-like in shape, with distinctive markings and vertically running rib margins. A spiny specimen, which are produced along the stem margins and each stem topped with a tuft of large and beautifully veined, deep green leaves. As a deciduous plant, the leaves drop in winter time and are followed by small scarlet-red flowers around spring. A really stunning house-plant, so no surprise in its growing popularity, and just perfect specimen to add to your collection. 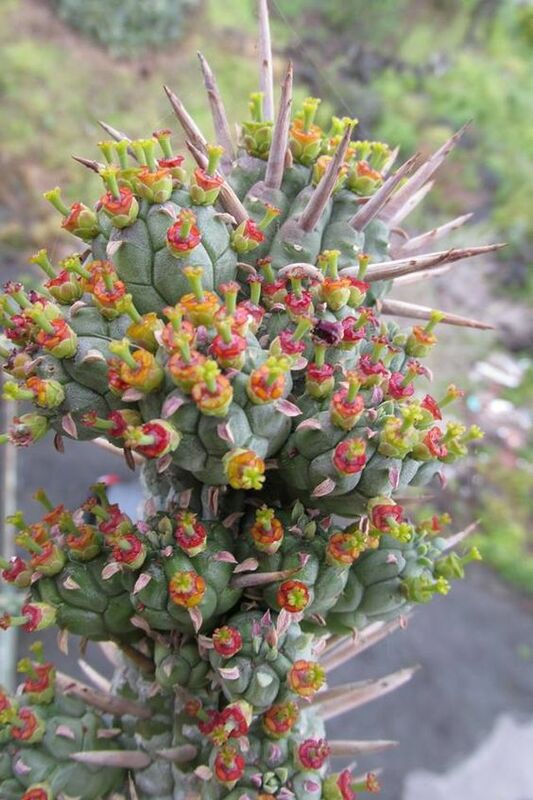 If ever there was a cactus-like Euphorbia species, this is it. 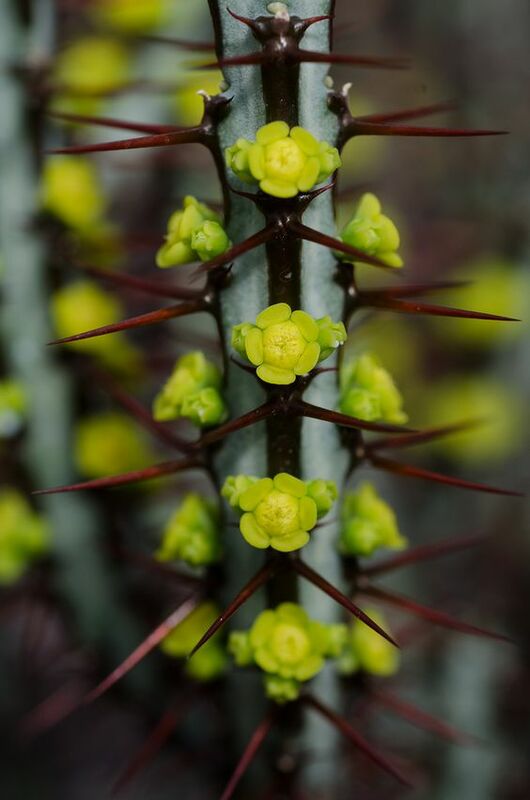 The Euphorbia horrida is native to the Cape Province of Southern Africa and has a shrub-like growth form. With a maximum height of around a meter and a half, that’s 4 ft 11 inches, this is a super-stunning, glaucous blue specimen plant with erect and ridged stems, bearing thorn-like spines on its numerous vertical rib margins. Interestingly, these spines are actually the dried and rigid remains of last years flower stalks, growing up to a fierce looking 4 cm in length, 1.6 inches. Amidst these spines, tiny green-yellow flowers appear around the ribbed stem margins and tip of this super succulent in spring and summer time. One of the most popular of all succulent Euphorbia specimens and one that definitely makes an impact. There are so many amazing species of Euphorbia, it has been rather hard to make a relatively small selection, trying to show diversities within such an expansive genus. Hopefully I have inspired the succulent-crazed among you to delve deeper into the world of Euphorbias – the only way to fully appreciate this special and botanically fascinating plant family.